I’ve mentioned before that Chris and I have been taking things pretty slowly and carefully with our kids and what they’re exposed to, as far as our relationship. And I think it’s gone really well – our kids get along well together, and his kids seem to like me, and my girls adore him. One of the things that he and I have talked about many times, but hadn’t actually done yet, is having a sleepover when the kids are in the house. On the nights when Chris doesn’t have his kids, sometimes he’ll come over for dinner and hang out until after the girls go to bed, but typically he’ll come over around 9 p.m., after the girls are already asleep, and he leaves to go home long before they wake up in the morning. The kids had a great time, although it was ridiculously hot and sweaty at the park. After a couple of hours, we split up – he took his kids to their mom’s house, and I picked up Jasmine (my girls’ favorite baby-sitter) on our way home. The plan had been that we’d go back to our respective homes and clean up, and then Chris would pick me up for a date night on Saturday night. I showered and got dressed while the girls hung out with Jasmine (seriously, teenagers are the BEST), and I ordered pizza for them to have while I was out. It was getting kind of late, and Chris hadn’t gotten to my house yet, which was odd. Yikes. So, instead of him picking me up, I hopped in my car and took off to pick him up. He had managed to get his car into a parking space by coasting downhill into a shopping center. He called his mechanic (who happens to be a friend of his), and he said he’d come out to meet him the next morning to look at the car. But basically he was stranded with me from Saturday night until around 11:00 a.m. on Sunday morning. And that’s the backstory on how we had our first official sleepover with the kids in the house. He couldn’t leave before they woke up, because his car was dead in a parking lot five miles from my house. Around 6 a.m. on Sunday morning, Lucy came to get in bed with me, the way she always does. I let her climb in, but I said, “Look, baby, Chris is here too, see?” I didn’t want her to be scared, and she wasn’t, she just looked kind of confused. I scooted into the middle of the bed and pulled her up next to me, and she kept craning her head up to look over me at Chris, like, “Huh. Well this isn’t part of our routine.” Then finally she lay back down and went to sleep for a while. By 8:30, Catie came into my room too, which woke us all up. She saw Chris was there and was totally unfazed. Lucy was happy by then too, and I turned on the TV in my bedroom for the kids to watch cartoons for a while. They climbed all over us and tickled each other and laughed, and it was a really great little moment there. 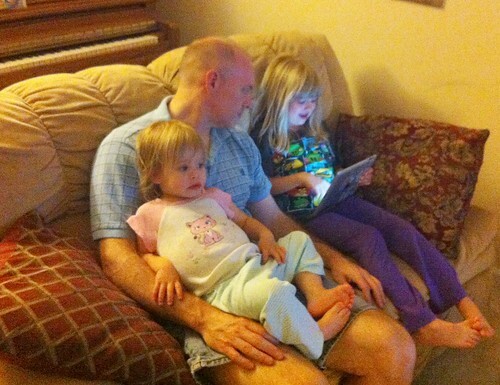 I love that my girls love him and are totally at ease with him. In fact, on Sunday morning, I fussed at Lucy for something (I don’t even remember what, it just got a, “no ma’am, we don’t do that” from me), and she ran to Chris and buried her face in his neck for comfort. And Catie gives him hugs and kisses whenever she can. Watching how easily their relationship has developed makes me really happy. He’s great with his own kids, I should’ve known that he’d be equally great with mine. And then she dropped it, and she hasn’t said a word about the sleepover since then. I know my dad will eventually find out, and I’m sure he’ll flip his lid, because even after two kids, he can’t handle the idea that maybe I’m not a virgin anymore. But as much as I love my dad, he doesn’t get to dictate the rules of my relationship. So, if/when he finds out and gets upset, we’ll deal with it. That’s just life. But right now? Life is really, really good. Long time reader, infrequent commenter here. I am soooo glad that things are going well in your relationship with Chris and that everyone seems to be transitioning and getting along so well. I felt so bad for all you went through with the divorce and it is nice to see you happy. That said, one part of this post screamed at me (I work in the missing and exploited children’s field so am super sensitive to certain things because of seeing so many cases where one small thing leads to another) and that is the part where you ask Catie to lie/keep a secret. I TOTALLY get why you did and that the thing you asked her to lie about/not mention is not a big deal. I just want to say that it is never a good idea to do this with little kids because it grooms them to think that it is ok for an adult to ask them to keep secrets from other adults and kids are not great at knowing which secrets are little things that are ok to not tell and which things they NEED to tell. Kids can get confused, and if someone were ever to hurt Catie in some way and then told her to keep it a secret/not tell…she might think that was ok because her parents have told her the same thing before. Please, please know that I know that is not your intention and I know this is a little thing adults ask of children often because it seems harmless. Kids need to know that they NEVER need to keep something secret from their loved ones even if/especially to protect another adult. They are kids and really need to have it ingrained in them that they don’t need to keep secrets and it is always ok to talk about things. Just something to think about and please don’t take offense. I’m not offended, I hadn’t thought of it that way AT ALL and you’re right that I should be careful about that. I did tell her that the only reason I didn’t want to talk about it with Pop-Pop was because he’d get mad at me (not at her), but that she could talk about it with Mimi (my mom) if she wanted to. But you’re right, secrets are generally a bad idea with kids, so I definitely need to re-think that approach. I think most people never think of it that way, because who wants to think of think of things like this during simple, everyday moments, right? I know I’d never thought twice about it until I started working where I do now. Now I am an annoying ambassador of such info, ha. You are a great mom, btw, and your girls are so lucky to have you! So happy to see you so happy!